Pre-cut fabrics are everywhere today. There are so many names of the various sizes that it can be confusing. I've mentioned to quilters before, "Why not buy a layer cake?" and they want to know what a cake has to do with quilting. That's when I realized pre-cut fabrics and their names are confusing. Not only are the names confusing you start to wonder just how much you are paying for the pre-cut. We all understand how much fabric costs per yard but when you start buying strips or squares it's not as easy to figure out just how much you are paying for your fabric. 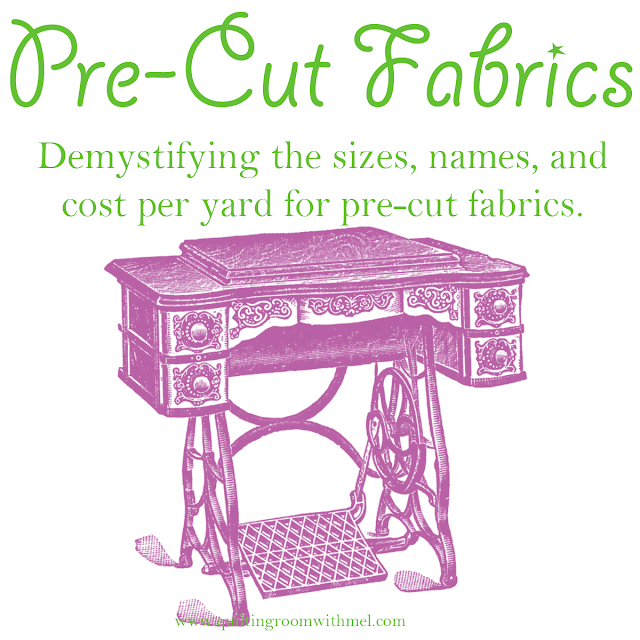 By the end of this post you'll know the names of pre-cut fabrics, their sizes, and how much you typically will pay per yard for them. This post may contain affiliate links. Purchasing items from the links costs nothing more and puts a few pennies in the fabric budget. I highly recommend printing the above graphic off and tucking it into your purse, wallet, or wherever you'll have it when you need it. This way you can always have a reference for the pre-cut fabrics. I included fat eight cuts because some of us can buy them at our local shops. They aren't available everywhere but since some of us can get them I did include them. 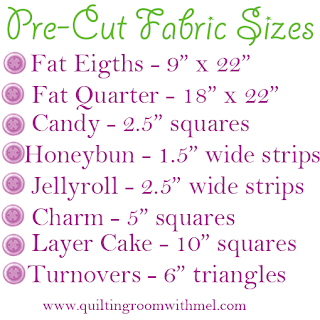 As you can see these are all very common sizes for quilting. Think of all of the patterns out there that call for 2.5" strips, you can buy those already cut! Let's do a price break down of each size versus yardage prices. I'm using Missouri Star Quilt Company for my pricing because they are on the web so everyone has access to them and they are known for their quilts made from precuts. Plus it keeps regional pricing out of the equation. In some things they are higher than my local stores but in others they are cheaper. I'm sure this is the same for you so I want a constant that we can all use. Fat Quarters - At your local store you probably can purchase fat quarters individually. Online you are going to find them sold as a bundle. This is how a lot of manufactures sell them, usually one fat quarter for each fabric in the line or in the colorway. Depending on how many fat quarters are in a bundle depends on the price. Standard prints average about $3.00 per fat quarter. Solids average about $3.02 per fat quarter. Batiks run a lightly higher at $3.87 per fat quarter. That means the average per yard is about $13.20. That's not much more than I pay per yard right now. Honey Bun - These come in bundles of 40 strips on average. They are width of fabric long. Single color rolls are cheaper than the rolls with multiple colors. The single color rolls will cost you $21.95 The ones with multiple colors are $23.95. There's not a large variety but if you need a lot of white 1.5" strips you are set. You get 1 2/3 yards of fabric in each honey bun. Single colors cost about $13.22 per yard and multiple colors cost about $14.43 per yard. Jelly Roll - These also come in bundles of 40 strips as well. They are width of fabric long. The average cost is $34.95 per bundle. There are tons of these available. You get 2 3/4 yards of fabric in each jelly roll. 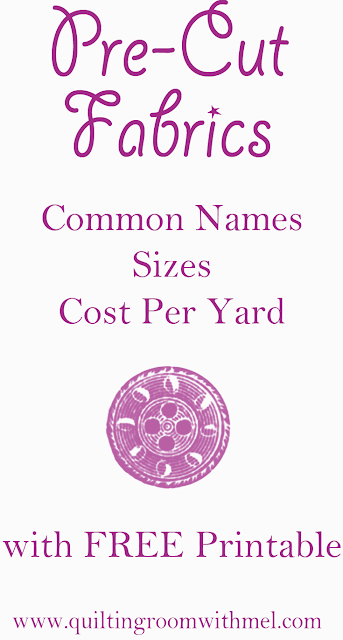 The average price per yard is about $12.70. Charm Pack - You get 42 squares on average per bundle. They average $8.95 each. The options are almost endless in this size. You get a little more than 2/3 yard but less than 3/4 yard of fabric in each charm pack. The average price per yard is about $13.16. Layer Cake - Just like charm packs you get 42 squares on average per bundle. They average $35.95 each. You will find a few layer cakes over the average but that's typical. You get a little over 2 3/4 yards of fabric in each bundle. The average price per yard is $13.07. The only con I have for pre-cut bundles is it takes away one of my favorite parts of making a quilt and that's picking out all the fabrics. Though I will confess that some days having the work done for me would make my job so much easier. The price for these are a little more expensive per yard than buying fabric off the bolt. You are paying for the convenience. If you struggle with picking fabric or with cutting the time saved is well worth the mark up on the pre cuts. Never miss a post from The Quilting Room sign up now ! You can also find me on Facebook, Facebook Group, Twitter, G+, YouTube and Instagram.